Becky & Adam moved to New Hampshire from California four years ago to be a part of the Free State Project. Adam works remotely as a software engineer, so moving to New Hampshire wouldn't require finding a new job. They rented for a bit in Manchester and then in Greenland, and decided that the Seacoast would be the best fit for them. Becky explains, "We wanted to stay in the Seacoast, close to our community of friends, and we ended up in Dover because we found a house we loved! The "Freecoast" is beautiful and has a ton of resources for kids and families; I don’t really think you can go wrong with any of the towns in the region." Since moving to New Hampshire, Becky, a stay at home mom to a 15-month-old and 3-year-old, started a Facebook group for “Future Seacoast Homeschoolers,” to help connect parents of pre-school aged kids who plan on homeschooling. The group has grown to 150 members and their weekly meetups often draw about a dozen families. According to Becky, "Homeschooling is incredibly popular in New Hampshire. I’m very excited for our kids to grow and learn in such a thriving and positive environment." Becky, Adam and the kids are enjoying all that Dover has to offer, but especially enjoy all that the downtown has to offer: Flight Coffee Co with its New Hampshire-roasted coffee, the Children’s Museum of New Hampshire, and the kids’ room at the Dover Library. Welcome home, Becky & Adam! New movers from Louisiana, Forrest & Callie moved to New Hampshire in search of a private, quieter & more rural area where they can enjoy hobbies like hiking & target shooting. The couple has dogs, and wanted space for their pooches to run and play. 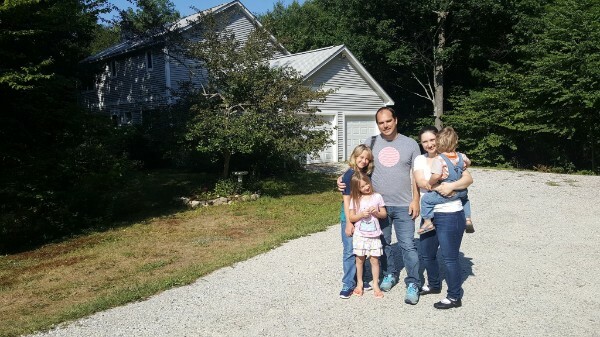 Forrest, an optimization, data mining and software development consultant, and Callie, a former high school biology teacher, purchased a house they loved in the Seacoast. "We chose Hampton Falls because it was convenient to Portsmouth and the coast, as well as Boston, but rural and remote-feeling." The area is also appealing because of its promising maker-spaces and collaborative software development groups. And Forrest, who plays guitar, is looking forward to connecting with other musicians in the area. Now that they are living here, they find that they love how beautiful the state is and how friendly the people are. And the location is the perfect fit for them: "We live next to an apple orchard that has a farm-to-table cafe. Down the street from our house, and across a covered bridge, there is a farm that sells grass fed beef and pasture raised chicken eggs. It is a beautiful area." Now that they are in the Freecoast, New Hampshire, Forrest and Callie are planning to help with jury outreach and are excited about New Hampshire's stance on fully-informed jury rights. Welcome home, Forrest & Callie! New movers and Free State Project signers Trevor & Melissa knew they wanted to get out of the San Francisco Bay area. The area was much too crowded, and they were looking for a family-friendly place to raise their three children. Trevor, who works for a tech company, and Melissa, a homeschooling mom, decided to look at properties in Concord. The area's central location, nice community, shopping, and downtown really appealed to them. Now that they're in New Hampshire, Trevor is working on building a studio for rehearsing and recording music and producing podcasts. "I'm looking forward to playing music with other musicians in the area once it's up and running." Welcome home, Trevor, Melissa & family!